Widget tracks stats on your favorite NHL team. Is there a better alternative to Hockey Widget? Is Hockey Widget really the best app in Icons category? Will Hockey Widget work good on macOS 10.13.4? 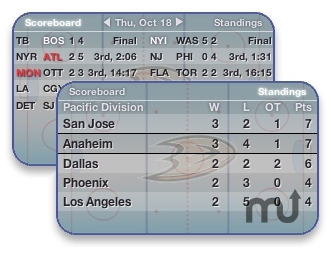 Hockey Widget is a Dashboard widget that helps you track daily schedules of your favorite NHL team. It also displays past and current standings(both division and full conference). Hovering the pointer over a game that has concluded (or is currently in progress) shows the period by period breakdown of scores as well as game leaders (or last play and last goal for games in progress). Fix bug which would cause the scoreboard to update for a while just after a game has finished. Remove random text appearing in game popups for ongoing games with no score. Hockey Widget needs a rating. Be the first to rate this app and get the discussion started!